I like my terracotta pots with a well used and old look. 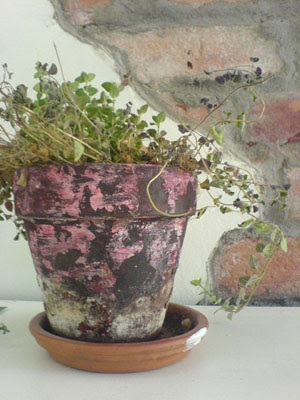 Terracotta pots become amazing works of art when they are really old and have a worn appearance. But who has time to wait that long? Nicely aged terracotta pots you can buy in stores are expensive! Some I have helped by using filler and various oil colours. A couple of easy, but relatively time-consuming tips are digging pots down in the earth for a while. But it takes quite a long time before they transform into antiqued look pots. Give the pots lots of water, and the chalk content found in the terracotta will give a nice patina.. The best tip is to use a homemade mixture of plain yogurt and cut up some moss from the garden. Apply the mixture to your pots and let them stand outside in the shade for a couple of weeks. 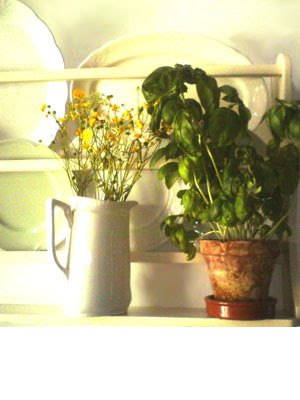 This will add som nice character and give your terracotta pots an antique look.